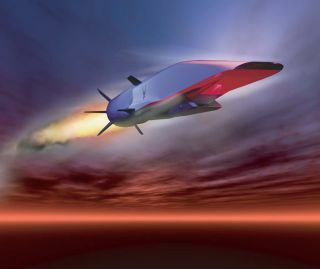 This Air Force illustration depicts the X-51A Waverider scramjet vehicle during hypersonic flight during its May 26, 2010 test. Powered by a Pratt & Whitney Rocketdyne SJY61 scramjet engine, it is designed to ride on its own shockwave and accelerate to about Mach 6. China's recent test of a hypersonic vehicle should not unduly alarm the United States or any other nation, Chinese military officials say. The test of China's new "hypersonic glide vehicle," which apparently took place Jan. 9, was not designed to advance the nation's ability to penetrate American missile defense systems, according to a statement issued by China's Ministry of National Defense. "It is normal for China to conduct scientific experiments within its borders according to its plans," the statement reads, the state-run newspaper China Daily reported today (Jan. 16). "The tests were not aimed at any nation nor any specific target." China's hypersonic glide vehicle is likely launched atop an intercontinental ballistic missile (ICBM), then released at an altitude of 62 miles (100 kilometers) or less, according to the Washington Free Beacon, which first reported the test on Jan. 13. The glider can then zoom toward its target at up to 10 times the speed of sound (which is about 761 mph, or 1,225 km/h, at sea level). A hypersonic glide vehicle carrying a warhead would be more difficult to detect, track and intercept than a standard ICBM because the former's trajectory doesn't reach outer space, the Washington Free Beacon reported. Many officials in the United States have expressed growing concern about the pace of China's military development. But China has a long way to go before overtaking the US in this field, some experts say. "The US still enjoys the leading position in military ability, both strategic weapons and conventional armaments," said Fan Jishe, an expert on US studies at the Chinese Academy of Social Sciences, according to China Daily. "The US has been devoted to high-tech weapons research for a long time, and China is still rather backward in this field." Indeed, the Pentagon has been developing its own hypersonic vehicles for years. For example, the Air Force worked with the Defense Advanced Research Projects Agency (DARPA) on the $300 million X-51A hypseronic program, which began in 2004 and wrapped up in May 2013 with the test flight of the fourth and final robotic Waverider scramjet vehicle. And DARPA has also been developing an unmanned bomber prototype called the HTV-2, which reached 20 times the speed of sound during an August 2011 test flight before losing control.